Back when I first heard about a Blade Runner (1982) sequel, I was skeptical about its quality. Sure, the ending was a little open-ended, but it stood by itself quite well. A Blade Runner sequel coming out mere years away from the original’s futuristic timeline of 2019 seemed just as ridiculous. The one redeeming factor that eventually led me to think this sequel would be any good was that Denis Villeneuve was tapped to direct it. While I’ve liked Villeneuve’s films as far back as Prisoners (2013), I’ve really become a fan since his Best Picture-nominated Arrival (2016) revealed how well he can do science fiction. Of course, Blade Runner isn’t really science fiction. Sure, it has the trappings of a futuristic society, but at its core, the movie is a noir. The plot and aesthetic of noir is considerably different than that of sci-fi, but Villeneuve manages to merge the two into a visual beauty that I think would rival the art you could find in museums. In fact, I would almost wager that every single frame from Blade Runner: 2049 (2017) could be hung in an art gallery and be indistinguishable from any other form of art. While the beauty of this film is undeniable, its pacing leaves a little more to be desired. Sure, Blade Runner: 2049 is beautiful enough to be in a museum of art, it just has the pacing of actually walking through said museum. I get the deliberate nature of the flow, and there wasn’t any point where I was falling asleep, it just felt slow for the sake of showing off the ambiance. Furthermore, while I thought the “artificial life” plot was done much better than Ghost in the Shell (2017), the digital assistant subplot felt derivative of Her (2013). The soundtrack also seemed to be channeling some Interstellar (2014) without linking to the same emotional impact. 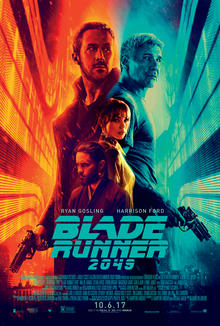 Pretty good for a sequel that didn’t need to be made, I give Blade Runner: 2049 4.0 stars out of 5.